I’ve been wanting to make a circle-in-square quilt with the Park Slope fabric ever since I got it, but was scared off by the curved seams. Well, I finally realized that I could start with just a cushion cover, which is practically non-committal, and see how I liked it. So I did. I made this pillow by sewing a circle through the “frame” fabric and a layer of white muslin, then cutting out the center of the circle, clipping to the seam, and turning the whole thing inside-out. Then I backed it with the center fabric. You are supposed to then secure the center fabric to the frame by sewing through all three layers around the perimeter of the circle… but I didn’t. It made the blocks fiddlier to join together, but it produced a fun three-dimensional effect that little fingers will appreciate. 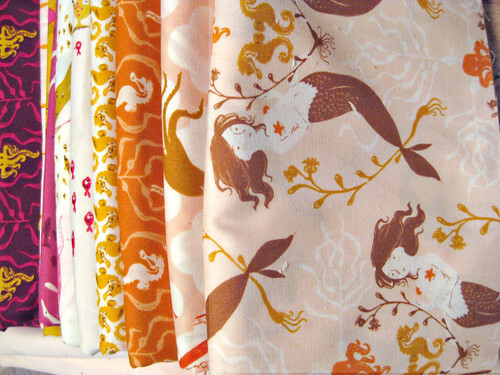 Having done that, I now FINALLY have inspiration for a quilt to make with my beloved Mendocino fabric. 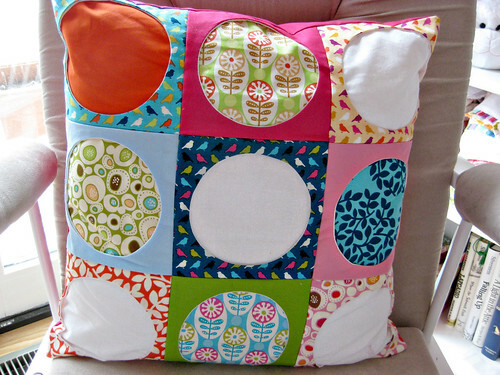 I’m going to make a lot of these circle-in-square blocks in a larger size (8″ maybe? ), with solid colors for the frames and the Mendocino fabrics for the centers. It will look like a wall of fish tanks, I think, full of octopuses and mermaids and swimming girls. It’s going to be great. But for now, I’m chasing the Nicey Jane success by using up my Dolce design roll in another simple, all-rectangles quilt top. 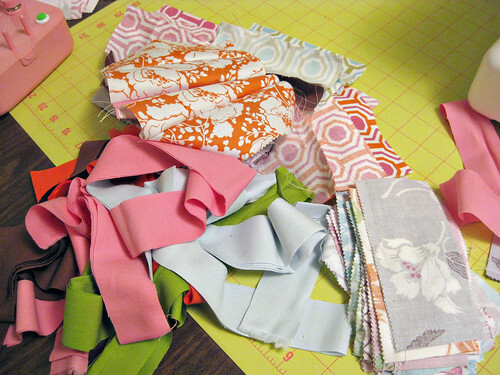 I will quilt it to a fuchsia fleece backing and bind it in orange. It’s going to be straightforward and awesome.